The historic designation of San Antonio’s last Pure Oil gas station at 901 Nogalitos will return to City Council for final approval, but NOT on April 18th, as originally scheduled. We intend to speak in support of designation when the case is rescheduled and invite the public to join us. This building is currently identified as “threatened” in the Spring 2019 issue of the National Trust’s Preservation magazine. Help us convince City Council to make this a national success story by designating and preserving this rare Tudor-Revival style building! Executive Director Vince Michael tells the story of the Society’s quest to designate the Nogalitos station and explores its potential for reuse in our Fall 2018 newsletter (p. 3) and in his blog article, “Gas Station – Why Demolish an Opportunity?” (please note, we are no longer trying to help find a buyer). The current owner remains opposed landmark designation and has applied for a demolition permit, even though the Pure Oil station takes up a very small portion of the larger, income producing property. 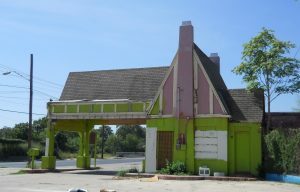 In 2012, the City Council of Geneva, Illinois faced almost the same scenario, involving the owner’s request to demolish a 1930s Pure Oil station. Because Geneva’s council recognized preservation’s importance to their civic identity, the gas station now serves the community as a branch of the Geneva Bank & Trust. New development is emerging along the Flores and Nogalitos corridors between Cevallos St. and San Pedro Creek. Art galleries, rustic restaurants, and tech companies are among the diverse businesses choosing to locate in this area south of downtown. What kind of asset could the station at 901 S. Nogalitos become for San Antonio?